Few anglers probably have ever heard of Lake Tawakoni except for some serious tournament catfish anglers. Of course that all changed last spring when word spread over the internet about a catfish tournament where three teams brought in five fish limits of over 200 pounds. The huge weights didn’t surprise catfish fishing guides Michael and Teri Littlejohn through because they had been putting clients on big catfish for years on Lake Tawakoni. This year the nationally known Cabela’s King Kat tournament trail begins the season on Lake Tawakoni. It’s going to be a slugfest with many of the best catfish anglers in the nation competing. Last year teams were bring in huge limits of five fish including the winning weight of 239.8 pounds setting the new Cabela’s King Kat Tournament Trail record; in addition to having a 67.84 pound monster blue catfish weighed in for big fish. Completed in 1960, Iron Bridge Dam impounds the Sabine River just 53 miles east of Dallas, Texas. The impoundment has 36,700 surface acre, 200 miles of shoreline with an average depth of 70 feet deep. It’s under the operation of the Sabine River Authority of Texas. It’s named after historic Indians tribes that live on the land in the area. Translated Tawakoni means “river bend among red sand hills”. 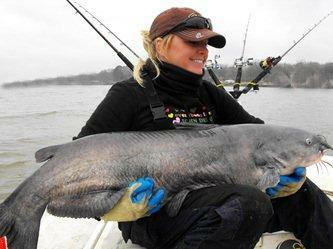 “Lake Tawakoni is the number one blue catfish reservoir west of the Mississippi. It’s had huge limits of catfish weighed in at tournaments and my clients are amazed at how many big blues we catch,” said Michael Littlejohn. Whenever possible, Littlejohn uses fresh shad for catfishing for blues on Lake Tawakoni. He likes them to be between 5- to 12-inches long. “I cut off the tail and discard it then cut and scale the rest of a 8-inch shad into three large chunks,” said Littlejohn. Fresh shad is best, but Littlejohn doesn’t just discard used pieces of cut shad chunks that have lost all of its blood and scent. “I like to put the shad chunks back in a Zip-Lock bag with half a bottle of Team Catfish Dead Red Blood Spray letting the pieces soak and reuse them,” said Littlejohn. Littlejohn (www.tawakoniguideservice.com) uses two different presentations when fishing for catfish. 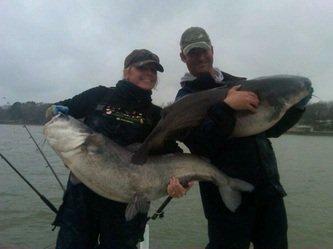 “I fish a Carolina rig a lot on Lake Tawakoni for catching blue catfish. It’s a easy rig to set up. For the main line, I use high visible Team Catfish (www.teamcatfish.com) Tug O War with a Team Catfish Sinker Slider that I attach a Cheapsinkers.com (www.cheapsinkers.com) 3-ounce sinker to then a swivel with a 30- to 60-pound Team Catfish Tug O War leader and 8/0 Team Catfish Double Action Hook,” said Littlejohn. If Littlejohn isn’t using a Carolina rig, he will have the rods rigged up with Santee Cooper Rigs. “I use the Santee Cooper rig that has a float to keep the bait off the bottom. Normally, I have about 36- to 48-inch leader on my Santee Cooper rig,” said Littlejohn. Before Littlejohn makes his first cast, he uses his graph to locate them. “I use the SideScan mode to find the catfish. 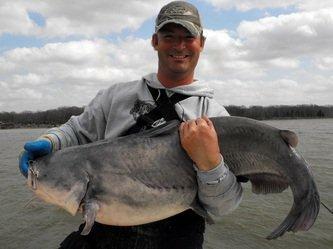 Most of the time big blue catfish will be around the ledges or humps where they can ambush the shad. Once, I locate them I will mark them on the GPS then anchor up the boat so we can make cast to them,” said Littlejohn. Littlejohn noted he usually anchors instead of drifting when fishing Lake Tawakoni. Although it’s legal to keep a big blue catfish on Lake Tawakoni, Littlejohn practices strictly catch-and-release with any blue catfish over 10 pounds caught in his boat. “Lake Tawakoni is loaded with 14- to 18-inch channel catfish that weigh 2- to 5-pounds if clients want to take home catfish to eat,” said Littlejohn. For channel catfish, Littlejohn uses light 7’ spinning gear rigged with 50 pound Team Catfish Tug O War braid. He will use a Carolina rig set up with a ½-ounce egg weight and 4/0 treble hook or pinch a ¼-ounce worm weight about 6-inches above a 4/0 treble hook. “We use Team Catfish Sudden Impact bait that’s enriched with fibers to keep the bait on the hook for fishing channel catfish,” said Littlejohn. He also baits the holes for the channel catfish to keep them around the areas there fishing. Right now it doesn’t get any better than Lake Tawakoni when it comes to fishing for big blue catfish. Prime time is from Thanksgiving till when the water temperature gets up around 65 degrees and they go to spawning. This entry was posted in Uncategorized on February 14, 2014 by Jeff Williams.